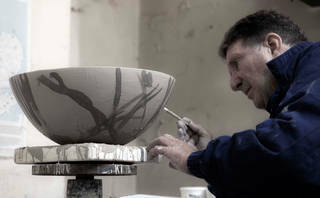 As part of the London Design Festival, internationally renowned artist Bruce McLean has created a new body of work, 'Garden Ware', with Stoke-on-Trent ceramicists 1882 Ltd. This new line of ceramics revisits an earlier divisive work by McLean, and asks the question: "what is a good pot?" In 1987, the conceptual artist Bruce McLean created a three-foot tall orange sculpture with a large beaker and a small handle. In form, it resembled a household jug, decorated with a semi-figurative woman whose face and hand were suggested through thinly cut lines. Although McLean's earthernware jug resembled a functional object, the design was completely impractical: "It can't pour… it is badly made… it doesn't stand up," were among the criticisms directed at it by V&A staff. In spite of its obvious shortcomings, Oliver Watson, the V&A's Chief Curator of the Ceramics and Glass Department at the time, saw merit in its design, acquiring it for the Museum's permanent collection. Yes, the "Craftsmanship was bad", he wrote in a paper responding to his colleagues' scepticism, but he couldn't help admiring it. It had no purpose, but the same could be said for other objects in the collection. 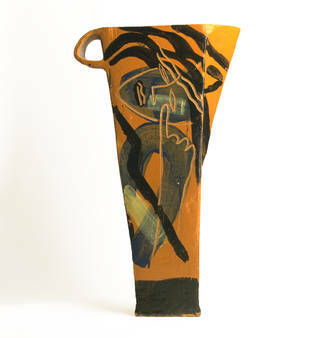 Watson concluded his critique by declaring that Bruce McLean is, "not a 'potter', but this is surely a good pot". 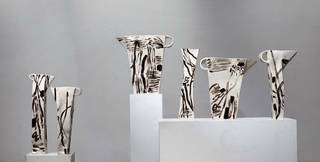 Now, thirty years later, McLean has created a new body of work entitled Garden Ware, made in collaboration with Stoke-on-Trent potters 1882 Ltd. These new works are, in part, inspired by McLean's original Jug and the response it provoked, reopening the question – what is a good pot? Bruce McLean in the studio at 1882 Ltd. Photograph © 1882 Ltd.
Works in progress: the Garden Ware range. Photograph © 1882 Ltd. The works include one-off and limited edition bowls and platters, which are cast by 1882 Ltd., using moulds belonging to the artist, and individually decorated by McLean in an uncharacteristic black and white palette. 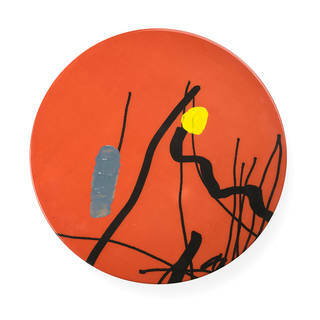 The platters are adorned with a silkscreen print by the artist, which he has embellished with streaks of paint. Earthenware jugs from the Garden Ware range. Photograph © 1882 Ltd.
Earthenware bowls from the Garden Ware range. Photograph © 1882 Ltd. 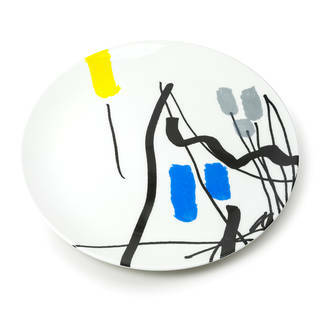 This is 1882 Ltd.'s second collaboration as part of the London Design Festival, and Bruce McLean's first. "Bruce is an artist and we are potters", explains Emily Johnson of 1882 Ltd., "Through this collaboration we aim to illustrate the journey from pure artistic interpretation to a fully functioning industrially crafted product". And this time, McLean's work – with 1882 Ltd.'s help – has undoubtedly passed the 'good pot' test. Garden Ware will be displayed in the V&A's Ceramics Galleries (rooms 138 – 143), from 16 – 24 September 2017, as part of the London Design Festival. 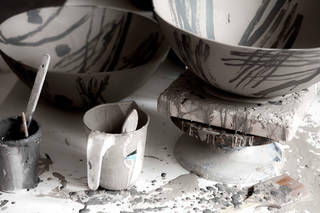 Alongside the new pieces on display, McLean will seek to both answer and confront the question of what makes a good pot, with a hand-drawn map that directs visitors to some of his and Oliver Watson's favourite "good pots" in the V&A collection. The collection will be available to buy in the V&A Shop and online. This collection includes the limited edition of 50 unique platters, the limited edition of 50 tangerines and four fine bone china dinner plates that reproduce the decoration from McLean’s platters. 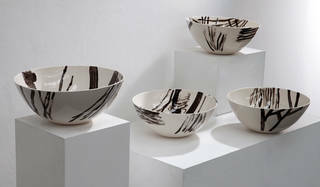 McLean’s earthenware bowls (photographed above) are available to buy in the V&A Shop only. Fine bone china dinner plates from the Garden Ware range. Photograph © 1882 Ltd.
Customers will be able to pre-order items from this range on 7 September. The complete limited edition range will be available to buy online and in-store on 16 September. 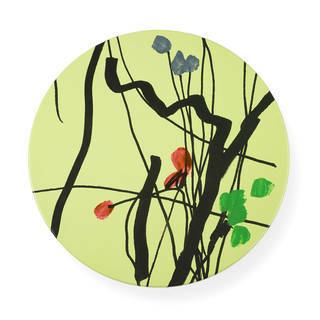 Garden Ware Platter 44 by Bruce McLean for 1882 Ltd.
White Garden Ware plate 18 by Bruce McLean for 1882 Ltd.
Garden Ware Platter 14 by Bruce McLean for 1882 Ltd.